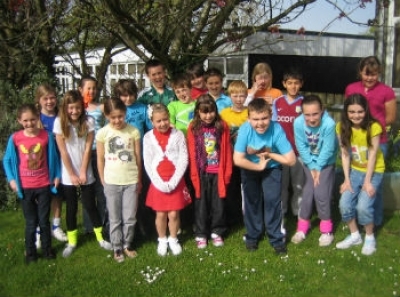 Children at Carbeile Junior School took part in a rainbow mufti day just before they broke up for the Easter holidays to raise money for Ellie’s Haven. The rainbow mufti days have long been a signature fundraising event of Ellie’s Haven, with plenty of schools and clubs supporting past events. The school, which has helped raise money for Ellie’s Haven through several other events, is still counting the money it raised and the children are looking forward to letting Ellie and her family know their grand total. It isn’t the first rainbow mufti the school has played host to and last year it welcomed Nigel Libby to the school to talk about Ellie and the charity.